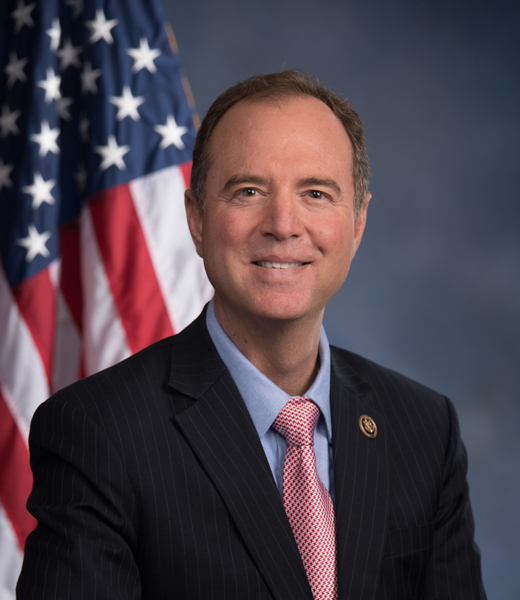 Congressman Adam Schiff represents California's 28th Congressional District, and throughout his tenure in Congress, he has focused on growing the economy, bolstering national security, strengthening our communities, helping small businesses, and improving education, safety and health care for our children. In his 9th term in the House of Representatives, Schiff currently serves as the Ranking Member, or top Democrat, of the House Permanent Select Committee on Intelligence and is on leave from the House Appropriations Committee. The House Permanent Select Committee on Intelligence oversees all of the nation’s intelligence agencies. Before he was elected to Congress, Schiff served as State Senator for California's 21st State Senate District, chairing the Senate Judiciary Committee, the Senate Select Committee on Juvenile Justice and the Joint Committee on the Arts, and he served with the U.S. Attorney's Office in Los Angeles for six years, most notably prosecuting the first FBI agent ever to be indicted for espionage. Interested in becoming a sponsor for this event? Contact Jaclyn McVay at (949) 824-2921 or jmcvay@law.uci.edu. Contributions over the value of $150 per dinner ticket may be tax deductible. Please consult your tax advisor.